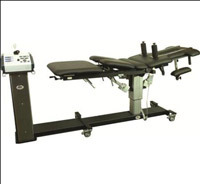 Klinedinst Chiropractic, Kennedy Certified Decompression practitioners, utilizes the Kennedy Neural-Flex Decompression System for the non-surgical treatment of spinal injuries and spinal pain. Decompression Therapy effectively relieves the pain associated with disc herniation, degenerative discs, stenosis, posterior facet, sciatica, headaches, and other spinal related syndromes, by reducing the pressure on spinal discs and facet joints through unloading created by distraction and positioning. Inversion therapy is also available for thoracic pain and symptoms. Spinal discs are avascular structures, meaning that they do not have an adequate blood supply like muscles in the body do. The lack of blood supply means that discs in the spine heal naturally at a very slow rate and current research states that a spinal disc heals in 300-500 days without treatment. By employing Decompression Therapy, an osmotic interchange of fluid can be used to speed healing of the disc by up to 71% and heal that disc in less than 100 days. Decompression Therapy begins with a series of sessions, typically 2-3 times per week. Each session is approximately 8-12 minutes. The extent and severity of each individual’s symptoms will determine the amount of sessions that will be necessary. Most patients experience relief in just 1-2 treatments! Call us today at (309) 647-8030 to schedule a consultation!